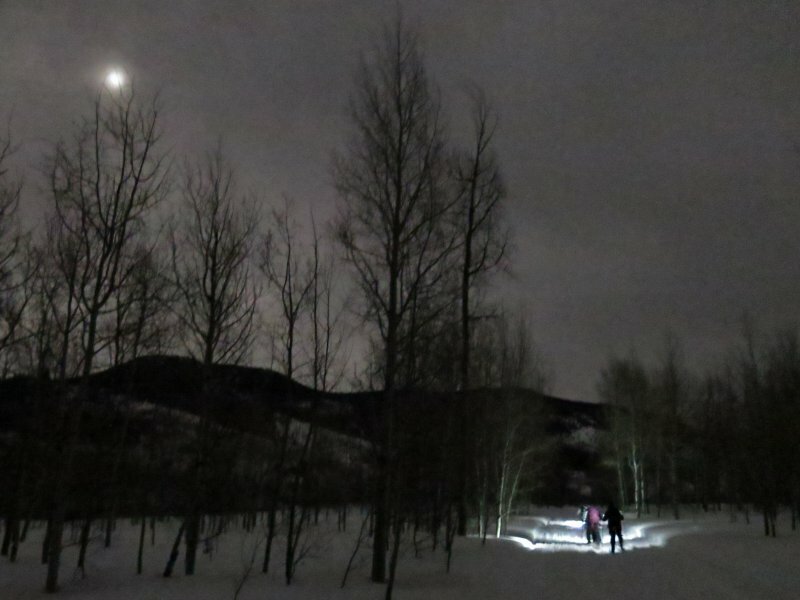 Eight Cache Hikers participated in our traditional moonlight trip this year. 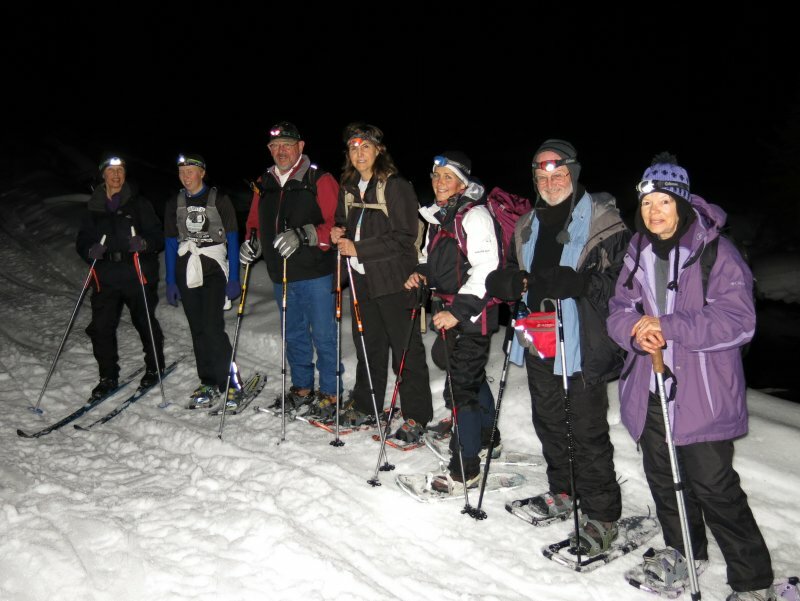 Leaders Dave W. and Jane were on skis, and the others, Terry, LaVae, Kip, Jeanne, Tim, and Nikki, used snowshoes. 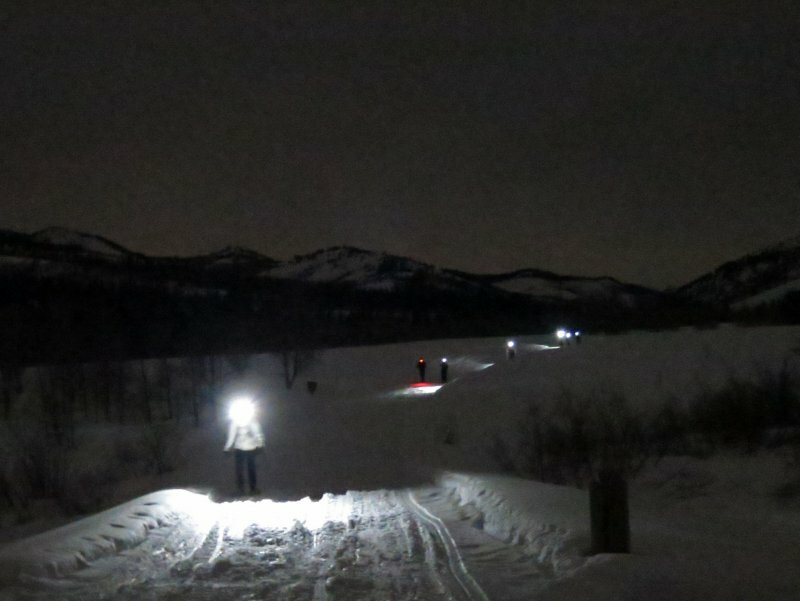 We met at 6:00 in Logan, assembled into carpools, and drove up Logan Canyon to the Franklin Basin Winter Trailhead. We had the parking area to ourselves, although it was crowded with snowmobiles, trucks and trailers earlier in the day. 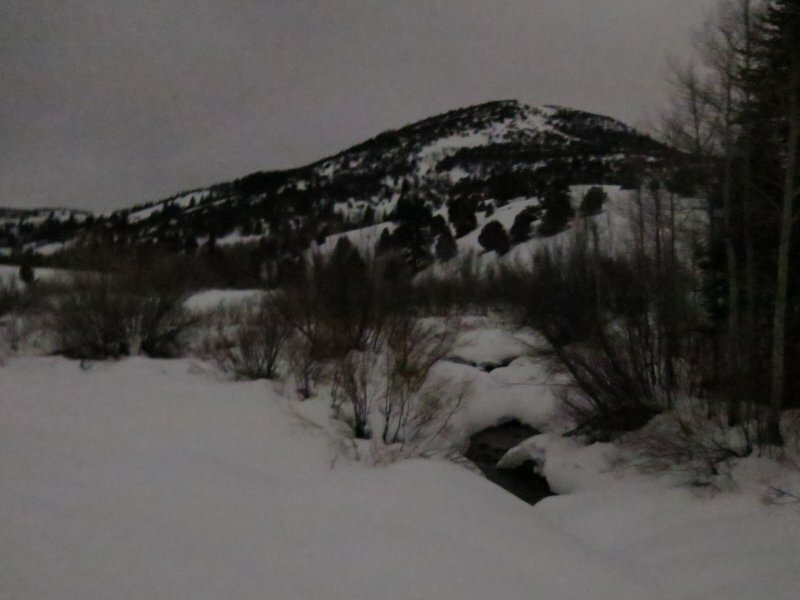 Our trip was one day after the full moon, however, so the moon was still below the horizon when we started on the trail at 7:00. The overcast sky was a concern, but we hoped moonlight would filter through the clouds. Recent heavy snow and warmer weather had created a high avalanche danger in the region, so we were happy to know that conditions were "safe" here. Accompanied by the sound and sight of running water, we followed along the Logan River as we headed northeast up Franklin Basin . After traveling about a mile through the untracked snow, the canyon narrowed and we moved to the groomed snowmobile trail for another 1/2 mile before heading off through the meadow to our destination. For our "lunch", we shared Valentine's Day cookies, candy bars and homemade brownies around the fire Dave built in a firepan. When the fire was out we doused the embers and packed up everything in plastic bags for the trip back out. By this time we could clearly see where the moon was located. The cloud cover prevented us from viewing the actual moon, however, and it was not bright enough to stop using our headlights. The snow surface had iced up a little, making for fast ski conditions as we went back down the snowmobile trail. Thanks to Dave W. for the narrative, photos, and GPS work.